Instagram has overtaken Snapchat as the most used social media app among US teens, according to a study. A total of 8,600 teenagers were surveyed for investment bank Piper Jaffray’s twice-annual look at so-called Generation Z’s habits. The report indicates that 85% of participants used Instagram at least once a month compared with an equivalent figure of 84% for Snapchat. But rankings were reversed when the teens were asked which they preferred. Snapchat was picked as the “favourite social platform” by 46% of those questioned, while Instagram was chosen by 32%. That figure may offer some reassurance to Evan Spiegel and other chiefs at parent firm Snap that their efforts to address a backlash against an unpopular redesign are working. But it is the engagement figure that has dominated headlines, and threatens to feed a narrative that Snapchat is on the decline. In August, Snap reported that for the first time the number of people using its service on a daily basis had dropped. And on 11 October, its shares hit an all-time-low after one analyst claimed the firm was “running out of money”. By contrast, Instagram is flush with cash thanks to its popularity with marketers. “Instagram continues to show dominance in selling, as teens overwhelmingly prefer brands contact them on Instagram versus other channels,” said Piper Jaffray in its report. 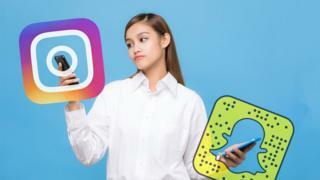 In particular, the Facebook-owned Instagram’s addition of Stories – which was launched in August 2016 – has fuelled its popularity among teenagers. The self-destructing videos and photos – which remain live for just 24 hours – were only introduced after a similar feature had already been popularised by Snapchat. But according to Instagram’s own figures, more than 400 million people use its version each day, which is more than double the number of people Snapchat says log into its service to carry out any activity over the same period. “Instagram will add just more than 12 million new users [in the US] this year, which is more than double any other social network,” commented Rimma Kats from the consultancy eMarketer in a report earlier this week. Piper Jaffray’s report follows a similar but smaller survey by the Pew Research Center earlier in the year. Of the 750 US teens it questioned in April, 72% said they used Instagram compared with 69% who said they used Snapchat. In the UK, the media regulator Ofcom publishes two studies – one that covers the 16-to-24s and the other that looks at 12-to-15s. Its latest figures for both age groups suggest Snapchat still has a slight edge over Instagram when it comes to usage, but the watchdog is due to update its figures for the younger demographic in about a month’s time.